As you may have noticed, we ladies at the test nest like our house smelling homey and delicious with baked and cooked goods. My love, Max, much prefers it to the random scented candles I occasionally think I need to purchase. I tend to agree. Cooking a chicken is one of those aromatic delights that can assure special interest in the kitchen from Max, and I'm all for that. So anyway, it was a cold Sunday afternoon in Chicago and I had quite a bit of planning to do for my squirrley freshman, so I decided to cook a chicken while I planned. 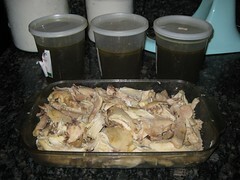 What's nice about cooking a chicken is you get a whole lot of chicken for not much money and you get a nice stock pile of chicken stock for soups or what have you. Also, you don't need much to do it. Of course you need a chicken (but eventually you won't even need that), but in this case I had some potatoes (notice the stems) that were about to go bad, some celery, carrots, garlic, some fresh and dried herbs, and a couple of shallots. That is what I had, so that is what I used. So first you need to chop up the ingredients. What is awesome about this is that there is no peeling and no fine chopping involved. I just cut the shallots in half and left the skin on them, the carrots were cut into about threes, the garlic was cut in half lengthwise with the skin still on, which looked really cool, celery keeps the leaves and everything. Easy breezy, just like CoverGirl. Now throw all that into a big pot and cover with water. As you can see mine is full to the brim, which isn't a problem. The last step is to add some salt, pepper, and herbs. I added some dried dill and thyme with some fresh parsley. We've got a great south facing window in the kitchen, so some winters we can get our summer herbs to hold on for a while. 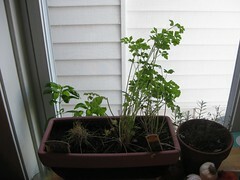 As you can see, the parsley is thriving! Here is everything. Check out that garlic! Yes! 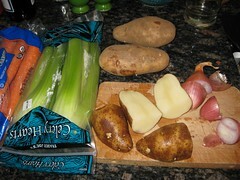 Notice how I didn't even cut of the stems of the parsley. All of those stems and stocks have good flavors so that is why we want to leave them on. Now, turn the burner on high and bring to a boil. 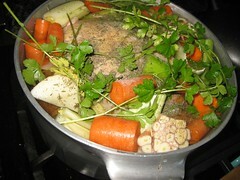 Once it boils for a couple of minutes, turn the heat down and let simmer for about 4 hours. This is where the house gets warm and cozy, and I focus on my plans for the freshman. I intermittently check on my goods, give it a stir, and flip the chickie over. After about 4 hours, I am done with my planning and it is time to get the chicken out. If you have some extra hands in the house, use them. Nobody wants a chicken on the floor! 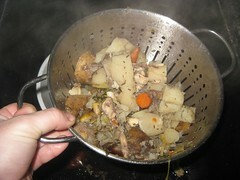 Using a colander strain out the stock from the discards. Put the stock in some sort of freezable container and let sit out for about an hour. Meanwhile take the chicken off the bone, this is pretty easy since the chicken is nice and tender by now. 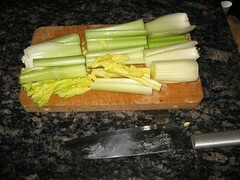 I save and freeze my bones and skins so I can use them, along with peels of veggies, stocks of celery, etc. that accumulate in the kitchen to use in future chicken stocks, that way you can do process this with no chicken, plus I use all those scraps that I always feel guilty about throwing away. Finally, after about an hour, you will notice a thin layer of fat forming on the top of your stocks. Skim that off so you don't have any unnecessary fats. And check out the reaping you end up with! Wonderful. 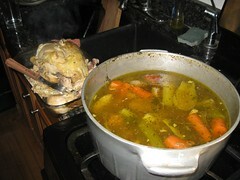 I've already got a chicken sandwich ready for my lunch tomorrow, and thoughts of chicken pot pies in the week ahead. Don't be afraid of cooking a chicken. You don't need to follow what I did, the point is, your grandma probably did something similar to this back in the old days. She used whatever she had around (which was probably never the same twice) to make something tasty, nutritious, and at that would serve the family for a while. Love the title! Great post, sista.